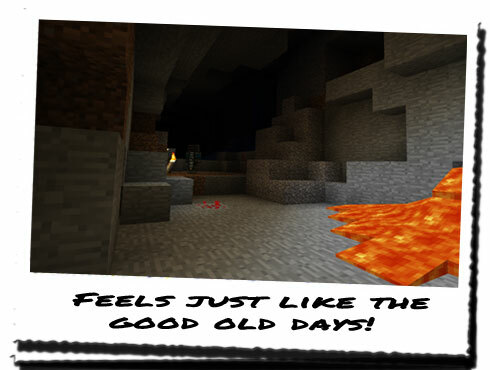 Diary of a Miner: Day 138: Good 'ol days! Once again we faced the issue of being unable to determine the time of day due to being deep underground, but when I awoke I took it to be quite early in the morning. 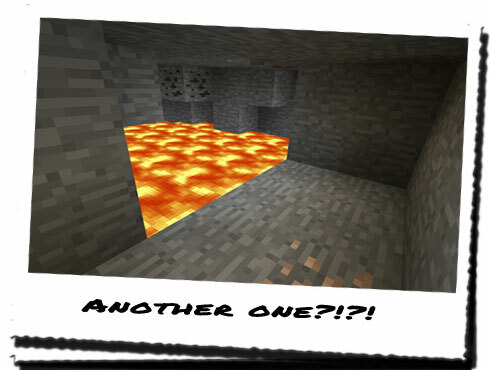 I was a little disoriented, admittedly, when I first got up however; seeing wall after wall of books and shelves, I assumed we were back at SERVERE's outpost, so I headed towards the door, expecting to head upstairs past the lava trench. Instead however I was presented with a small, stone passage leading to a chamber, and after realising my mistake I turned around and headed back inside the shack. I woke up the others inadvertently when deciding that toast would make a nice change for breakfast, but at least now I had someone to talk to. "Is it just me, or is toast just such an excellent method of waking you up in the morning? It's like it has this revitalising property to it which always seems to work!" Passing the slices of cooked toast around, I got four drinks together, and then passed those around as well. We all sat in silence, eating our breakfast together, collecting our thoughts for the day ahead of us, much like a computer booting up. "What's on the agenda for the day then?" "Good question... Provided you're okay with it, we can help you decode some more of the books whilst Syeonyx continues digging out the tunnel." "What's the point of decoding more of the books? I thought that was a cover to get me to come with you without realising where the coordinate papers had gone?" "Well it was, but with a potential wealth of information surrounding us, it'd be a waste to not have a look at what there could still be here left for us to find.."
"I suppose... How does Syeonyx feel about that?" I was perfectly fine with that! I had thoroughly enjoyed yesterday; getting back to what I should be doing felt right, and I was more than willing to do it again! The others set to work; UOPETA and THEROS took a few more books from the shelves, whilst AMPHIS started with a pencil and paper. I picked up the pickaxe from the wall headed off towards the tunnel I had started. I had no idea how long I had to go until I found something that would prove useful to us, but I was having far too much fun to complain! I had been working for a few hours now, and was having doing it on my own. Like before, UOPETA had come down with a snack or for a chat, and we'd reminisce about the "good 'ol days"! But a few minutes after he went back up, I encountered another... Obstacle... Well it's not so much an obstacle as it is another danger to my health. 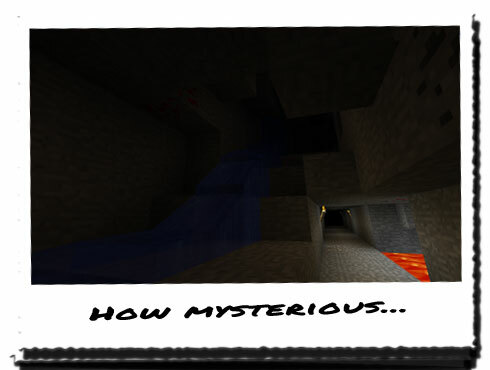 Another lava pool has appeared, only this time it is skimming the left edge of the tunnel. Provided there are no massive changes in pressure in or around the tunnel and the floor of the tunnel remained as sturdy as it was I would be fine. I shook my head and said that I had heard rushing water close to the tunnel. He seemed to visibly relax and exhaled quietly to himself before following me out of the passage into the tunnel again. We went back down to the far end of the tunnel, via the diversion, up to the wall where the rushing water could be heard. After waiting a few moment listening to the ambient sounds around us, UOPETA nodded and gave the all clear to continue. "From the sounds of it, the water is close by, but not a massive issue. If we could hear the water crashing against the other side of this wall, then yes I would be worried... But I think you'd be fine. I'll stay with you just in case though." "I have to admit... That was close..."
Turning around to view the waterfall, I was met with an ominously dark passage that led up and above the tunnel, away into the pitch black. Oh yes! Luckily UOPETA had brought a nice stock of torches with him, and after a little rock climbing, we made it onto what would be classed as the roof of the tunnel, heading back the way we had come, only above it. We found the source of the waterfall; a portion of rock way above us was spewing water at quite a rate, which ran down alongside the tunnel to pool below, before apparently running out from a hidden notch out of sight. As UOPETA had the torches, he led the way, but from around the edge of the corner we could see a source of light, and UOPETA stopped. I think it was more lava. Judging from the constant change in light intensity, it meant the source of light was fluctuating... Cautiously heading around the corner, we found out that I was right. Much like the waterfall, a small amount of lava was spewing out from a hole, pooling around a notch in the stone which it may have carved out due to the heat intensity. "This is what it's all about! This is what we should be doing, not hiding from HoN Co. whilst biting at their ankles trying to bring them down! This is so much..."